Copic Sketch 36B color Papercrafting set includes colors specifically elected for their popularity with papercrafts, scrapbookers, and stampers. Packaged in a clear plastic case and contains colors C5, W1, W3, B24, B32, B39, BG15, BG34, BG49, BV23, E11, E29, E31, E35, G17, G21, G28, G85, R02, R32, R35, R37, RV02, RV04, RV06, V04, V06, V09, Y11, Y15, Y38, YG03, YG41, YG91, YR02, YR07. 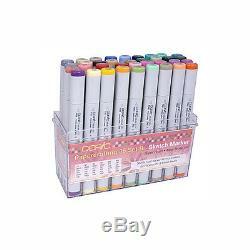 The item "Copic Sketch Marker 36 Stamping B Set" is in sale since Friday, August 28, 2015.